It's a message to every single child who has ever been aborted. The message comes directly from God Almighty. I will not forget you ! " I can only feel pity for a woman who has aborted her child for any reason other than a threat to either life. Our laws offer abortion for the sake of convenience. Any female who has or is considering an abortion, should pay close attention to the last sentence of the scripture above. "I can only feel pity for a woman who has aborted her child for any reason other than a threat to either life." 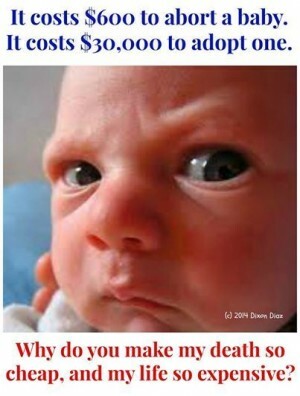 What you saying is that if there is a threat to the child's (fetus's) life, it is a reason to abort. How does that work? Were it not for your cranial issues I would be inclined to explain. Someone should have pinched his cranial issue 2 weeks before he was born! Sold his body parts for A.I. testing. And transplanted the rest into the bodies of rats. Being pro birth but refusing help ( food stamps-welfare) to the mothers and children who are poor is not pro life. That is my gripe about the whole thing. We go on about being Christians but we take a hardline attitude on the poor-- contraceptives--education -SOCIAL programs, and feel we are righteous and doing what is good for our country. What we really are doing is increasing the rate of abortion by taking away the very things that prevent abortion. Nobody wants to hear that either. Please allow us to help our neighbors and stop taking our money to buy your next election. Welfare should only go to widows and orphans. Like it was set up to do before the politicians found that by expanding it they can get easy votes. Plenty of jobs, find one and some self-respect. Then you too can lend a helping hand. I live in one of the poorest countys in Oregon-- The grade school my children attend has a 70% poverty rate so the kids get free lunch. My kids brown bag it. You would think that down here in food stamp land every body would vote for bleeding heart Democrats so they could get more free stuff. Well it is the exact opposite. My observation is that most poor people do not ever vote on anything and the ones that do in Coos County are voting Republican---reaching for the pie in the sky. Then call Mike Rowe and he'll help find them a better paying job. He's the Dirty Jobs guy. He helps with grants for trade schools that employers are looking for, like welding, and construction that make you sweat but pay very well. Amen and Amen very good Wolf counselor thanks for posting this it is needed. Sounds like Big Brother all right. Gotta control everything. Bravo! From an individual who is being held captive by the Socialist/Communist regime in Portland, Oregon. Is Oregon really that bad ? I was there in 2014 doing traffic surveys for the National Parks Dept. But I was in the Crater Lake area. It's a shame that the state is falling into socialism.